Fourteen degrees, but dry & sunny. & so, two pairs of pants, knee high socks (HOT MESS is right! 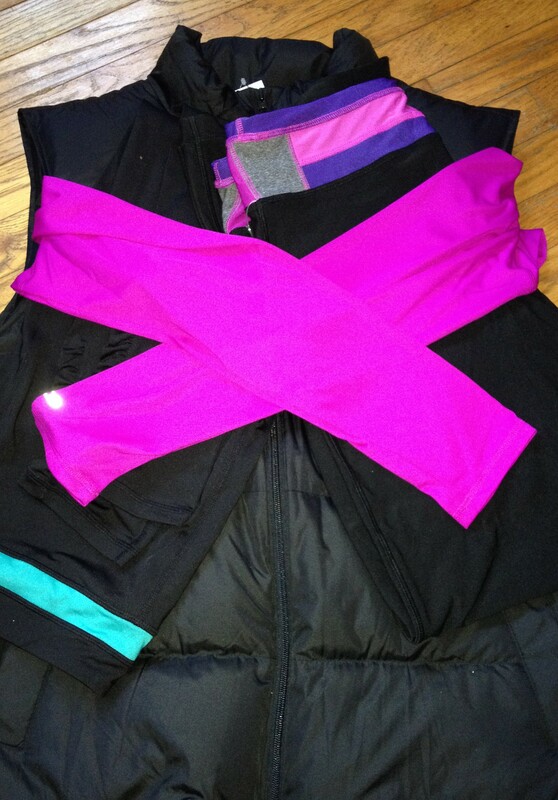 ), sports bra, tank top, long sleeve tech top (hot pink! ), down vest, gloves, scarf (wrapped around her face, her FACE!) and a pom pom beanie hat later we were set to head out. The only visible part of her were her eyes. I have to say, as cold as it was, it was so nice to be out there. A quiet day, I could even hear the music from her iPod shuffle. She listens to crap, dance-y nonsense, but it was kinda nice to be able to follow along with the beat as we went. Her singing, on the other hand, which pops out once in a while, that is much less nice. Good thing it’s winter and few, if any, neighbors are out & about to hear it. We didn’t go very long, or far, but the half hour we did spend running felt amazing. As did returning home to a still roaring fire in a woodstove, and two small, excited dogs to greet us.